The presence of the G allele of exon-1 +49 A/G polymorphisms of the cytotoxic T lymphocyte antigen 4 (CTLA-4) gene has been described as a risk factor associated with the development of autoimmune diseases. 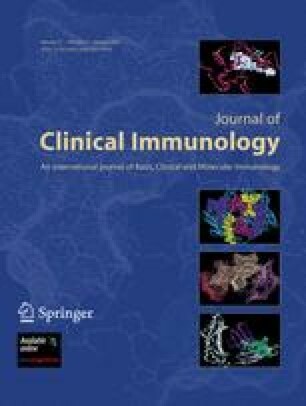 Since Common Variable Immune Deficiency (CVID) is associated with autoimmune manifestations in approximately 25% of patients, we sought to examine the association of the CTLA-4 single nucleotide polymorphism with autoimmunity and other inflammatory complications. Sixteen of 47 CVID (34%) patients had a history of autoimmunity, and 15 (32%) had known granulomatous disease with or without lymphoid hyperplasia. CTLA-4 genotype frequencies were AA 40% (19), AG 45% (21), and GG 15% (7). Allele frequencies were A 63% and G 37%, similar to control populations. There were no significant associations between CTLA-4 exon-1 +49 A/G polymorphism and autoimmune or lymphoid hyperplasia and granulomatous disease in this mostly Caucasian CVID patient population. Special thanks to Drs Li Zhang, Ulrich Salzar, Bodo Grimbacher, and Timothy Behrens for providing TACI sequencing data. This work was supported by grants from the National Institutes of Health, AI 101093, AI-467320, AI-48693 and NIAID Contract 03-22. Adina Kay Knight was supported in part by the AAAAI Clinical Fellowship Award.